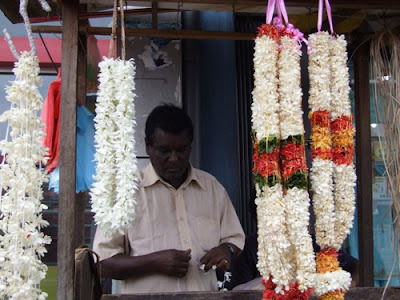 There are many garland makers along the Galle Road in Bambalapitty near the Hindu temples. Annamalai Navaratnam (50) is one of them. 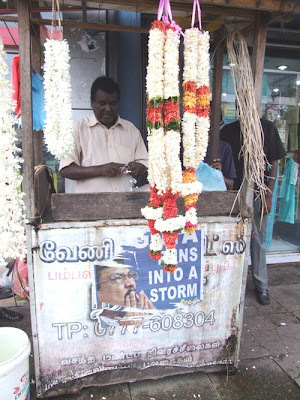 He comes to his small shop in the morning to make garlands along with his two assistants. 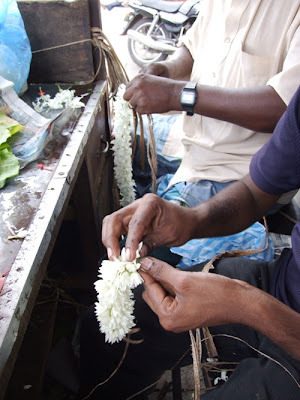 He is known as "Nava" among his fellow garland makers and customers. 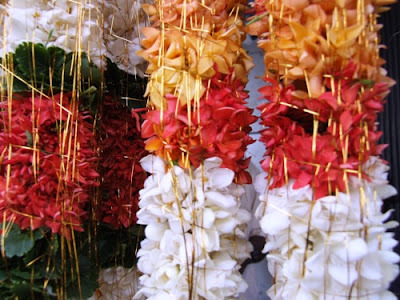 Nava has been making garlands for the past 25 years. He recalled his memories with a smile. 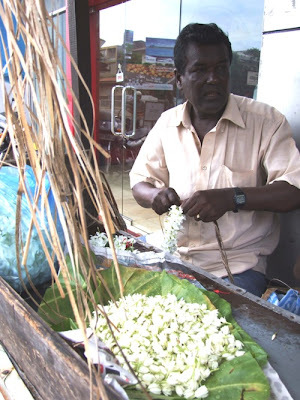 "I had the privilege of making cash garland ("Kasu Malai") made out of notes and coins to Kasiananthan. 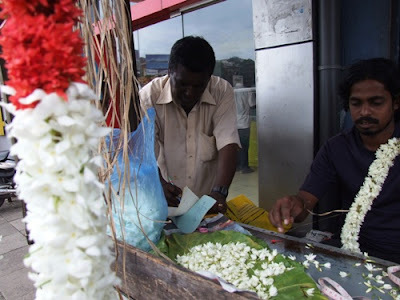 And I have made flower garlands to Kirupaananthavaariyar when he visited Sri Lanka. I also made garlands to Kambavaarithy Jeyaraj, and numerous politicians and well known people in the society" said Annamalai Navaratnam. He has two assistants to help him deliver the garlands on time to the customers. "I pay Rs. 1,500 to each of them daily, whether I have business or not. I get a lot of orders during the wedding season and temple festival season. 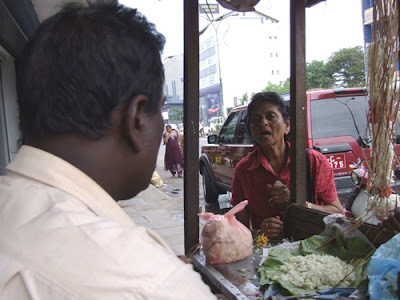 The customers make orders on the mobile phone. I have to compete with my fellow garland makers in the vicinity. 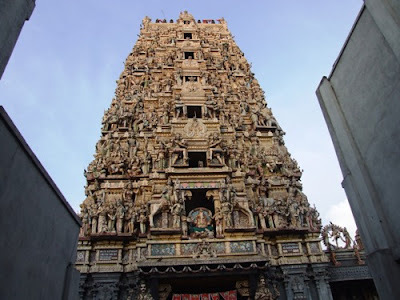 We have a healthy competition among us" further said Annamalai Navaratnam. 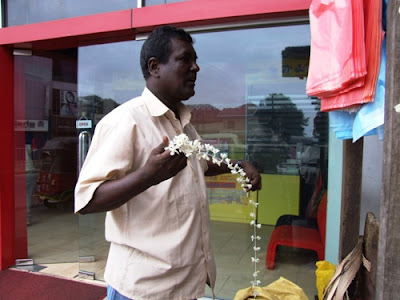 He buys flowers and banana strings from Matale in bulk. 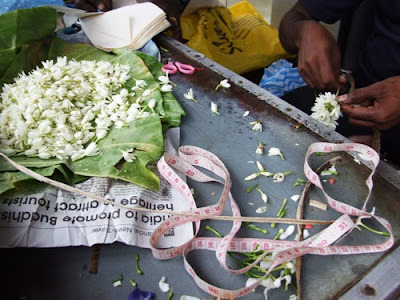 Flowers are very delicate like human hearts, and have to take extra care of them according to Nava.